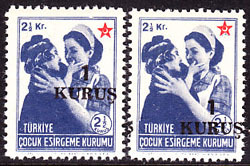 2146 VAR TURKEY (1943) Nurse with child*. Child*. Imperforate pair with red star missing. Scott No RA81, Yvert No 91. 2147 VAR TURKEY (1943) Nurse with child*. Child*. 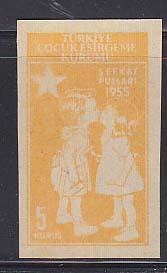 Imperforate pair with double impression of image and red star misplaced. Scott No RA81, Yvert No 91. 2148 VAR TURKEY (1943) Nurse with child*. Child*. Imperforate strip of 3 with red star misplaced. Scott No RA81, Yvert No 91. 16943 VAR TURKEY (1943) Red star*. Crescent*. Nurse*. Children*. Set of two pairs, first with imprint of star in red on gum side, second missing star altogether. Scott Nos RA71,73, Yvert No 91,93. 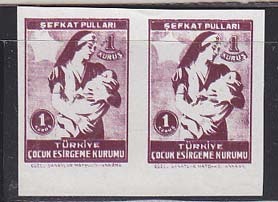 16944 VAR TURKEY (1943) Nurse with child*. Child*. 2 pairs with red star misplaced, 1 pair imperforate vertically between, 1 pair imperforate. Scott Nos RA81-3, Yvert Nos 91-3. 8003 VAR TURKEY (1952) Nurse with children*. Two pairs with inverted overprints. Scott Nos RA155-6, Yvert Nos 171-2. 11040 VAR TURKEY (1952) Nurse* and child*. Varieties with overprint in black instead of red, one misplaced. Scott No RA154, Yvert No 170. 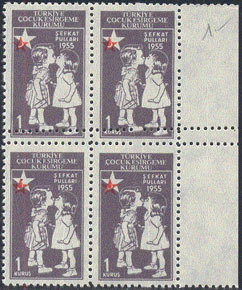 2150 VAR TURKEY (1955) Children kissing*. Imperforate with star in red missing. Scott No RA174, Yvert No 190. 5085 VAR TURKEY (1957) Red crescent*. Flower*. Margin pair imperforate horizontally. Scott No RA207, Yvert No 216. 627 VAR TURKEY (1959) Hawk*. Used pair on piece imperforate at top. Scott No C33, Yvert No PA43. 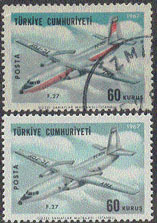 3442 VAR TURKEY (1967) Fokker F-27*. Variety with color red (fuselage) missing. Normal (O) shown for comparison. Scott No C40, Yvert No 1823.